and Overend, and built in 1936 by Blease Macpherson and Co. Through his regular articles in The Argus newspaper, the Australian Home Beautiful and other magazines, Best Overend became the arch-publicist of modernism in the 1930s. Arguably no other built example better illustrates his ideas during this period than Cairo Flats. Overend had worked in London with arch-modernist Wells Coates. On his return to Australia, he began writing on the minimum flat concept – an entirely functional living unit with built-in or fold-down furniture complete with labour saving devices. Cairo Flats was designed to illustrate these principles. The flats sought a distinctive type of accommodation; the custom designed bachelor flat, providing maximum amenity in minimum space for minimum rent. The minimal flats were supported by a communal dining room, an in-house meal and laundry service and lockable garages. Cairo established a major break with earlier types of flats in Australia. 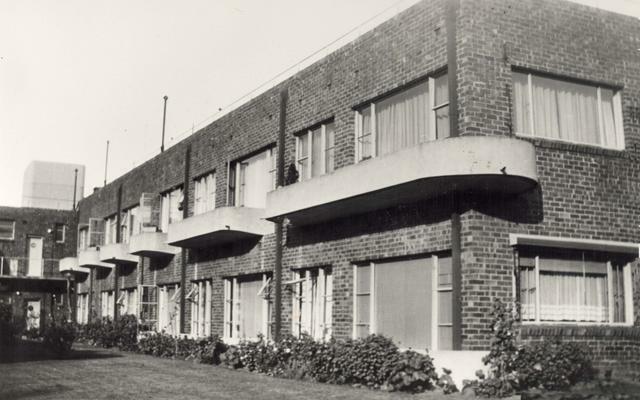 It is significant for introducing the flat to the modernist programme in Australia and for its acknowledgement of the existence of a new, modern way of living. Frequency Of Tours: Tours will run every 45 minutes with 10 people per tour. Queue at main entry point outside front gate.